Tuesday, January 9th, 2018 at 2:10pm. Friday, October 7th, 2016 at 9:19am. Spacious corner 2 bedroom, 2 bath home with stunning city and river views. Features include hardwood, stainless steel kitchen appliances, granite counters, & breakfast bar island, in-unit washer and dryer, gas fireplace, and a parking space is included in price! Pet friendly building! The tremendous location is just steps to financial markets, central loop business district, all transportation, university row, and shopping including Roosevelt Collection, Target, and Whole Foods. Monday, October 3rd, 2016 at 8:30am. One of Four Other Units in Historic Cummings House with this floor plan. One Bed and Den - largest one bed floor plan. Corner Unit Facing North West. Great Light, Spacious with Large Balcony. Enjoy Old Town and Gold Coast easily by foot. 98 Walk Score, you are steps from everything, Grocery, Transportation, Lake Michigan, Nightlife and Shopping. Everything you need is all right here! You won't be disappointed. Entire unit was just painted! Thursday, July 7th, 2016 at 10:54am. 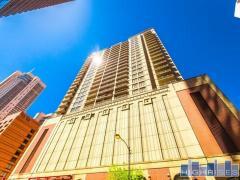 Large 1 bedroom at the Joffrey Tower! Incredible Location! This unit features Stainless Steel Appliances, Granite Counters, Espresso Cabinets, Hardwood Floors, In-Unit Washer and Dryer, East Facing Floor to Ceiling Windows with Lake View, Large, Private Balcony, 24 hour doorman, Large Gym, Community Room, Storage, and Bike Storage. Assessment includes Air Conditioning, Heat, Water, & Cable. Lake Michigan, Millennium Park, Museums, Theater District and Restaurants are just steps away. Monthly Garage Parking Available on Randolph. Rentals Allowed. Pet Friendly.